Designed specifically for basketball players, the Shock Doctor Ultra Basketball mouthguard has superior protection in a super low profile design. This low profile clear design protects teeth and gums from injury, without restricting breathing or speaking. The thinner, lighter Basketball Mouthguard was developed using over 20 years of Shock Doctor mouthguard expertise and leadership and features our innovative FastFit fitting system for an easy, low-temp, warm water custom fit. This fit system allows any athlete to have the perfect custom fit for secure and comfortable protection throughout the basketball season. 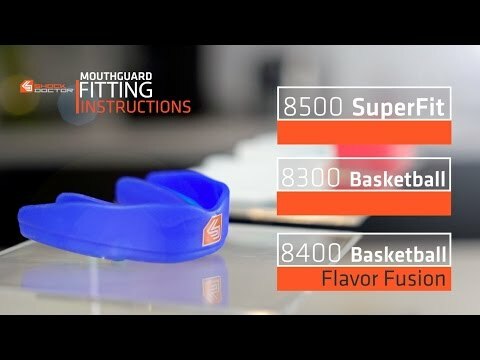 Basketball Mouthguard is rated 5.0 out of 5 by 1. Rated 5 out of 5 by Konata K. from Great Fit My son tried several other mouth guards and loves this one. He's 9 years old and plays on a travel basketball team. His dentist recommend he wears a mouth guard. He also see's Curry and Lebron wear one and wanted to get one. This one was easy to shape to his mouth. It was small enough for him to talk and easy to come in and out of his mouth. He also says it feels good on his gums and not hard like a few others he tried. He has the case holder which helps him not lose it and keeps it clean. He hooks the case on the inside of his basketball bag for easy access. I look at it like insurance, you will wish you had it, when something goes wrong.